About Webro Cable & Connectors - Products, News and Contacts. Fire Cable in both standard and enhanced full copper constructions fully compliant with BS 7629-1. Full copper and Cabnex (CCA) Alarm Cable in 4, 6, 8, 12, 20, and 30 core formats, including products compliant with BS4737 Section 3.30 types 1-3. CCTV Composites, with coaxial cables accompanied by either data or power cores ideal for use on camera signal, and data & control systems. Fibre cables from 1-912 fibres in both singlemode and multimode formats, including loose tube and tight buffered cables and low fibre count products for FTTH and 'last drop' use. Building & Lighting Control cables including 1 & 2 pair KNX and Lutron equivalent cables. Our team have over 250 combined years of experience in the cable market, ensuring that our customers receive the right product, for the right price, at the right time. 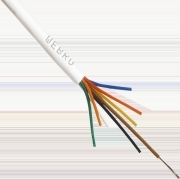 Webro are experts in the world of Fibre Optic Cable and Connectivity. Our Fibre cables and solutions have been rated as the UK’s fastest for FTTX broadband. What Alarm Cable is Best? There are many different types of alarm cable, and many different materials used to make them. But which is best suited to your needs? After an audit, Webro are pleased to announce that our ISO:9001 accreditation has been renewed. We now stock Firetec fire cable in both standard and enhanced varieties. Will your fire cable continue to work even in the harshest conditions?